Finally the Asus Eee Pad Slider will be available in the United States. The pre-order page at ExcaliberPC is up and list the 16GB model for $479. The 32GB model will set you back an extra $100. The Asus Eee Pad Slider is currently available in part of Europe and Taiwan but only in the Wi-Fi model. It will operate with Android 3.2 Honeycomb. 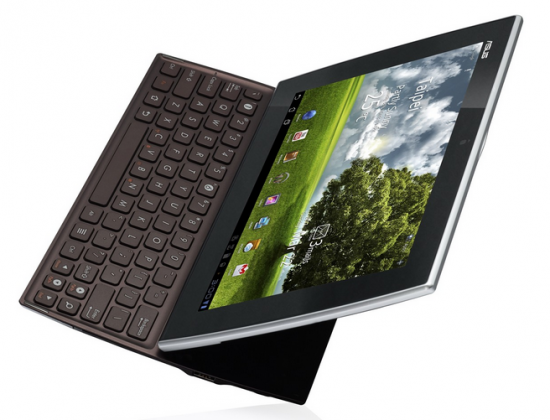 The Asus Eee Pad Slider comes with a NVIDIA Tegra 2 Dual-core Processor and 1GB Memory. It has a 10.1 inch screen, WXGA 1280X800 Resolution screen. Along with LED Blacklist IPS Panel Display. Not to mention that it will have a 9.5 hour battery life along with a slide out keyboard. It will feature USB port, MicroSD card reader and mini HDMI connectivity. ExcaliberPC: Pre-Order your Asus Eee Pad Slider 16GB model for $479 or 32GB model for $579.